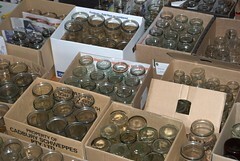 We have bought about 250 fowlers jars in the last week, we are joking we’ll be OK if some disaster happens, will just have to eat lots of fruit. 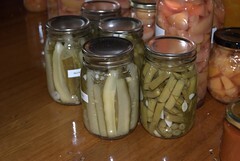 chutney and relish – lots! The idea of being able to do lower acidity veg and dishes containing meat such as home made baked beans, pea and ham soup, minestrone, curry sauces, vegie curries etc is intriguing me. I have costed a pressure cooker and it comes in around $180 from Amazon when you add in delivery and a few accessories. Planted out broccoli (green and purple), caulis, cabbages into c1 and c5. 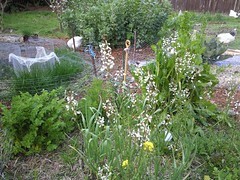 Cleared out parsnips and coriander and scattered their seed far and wide. Weeded C3 and C2 in amongst the carrots. Beetroot growing better in C3 where i gave them more space. Combined compost from two black bins which were about 2 weeks old and needed a remix and rewet. Currently I have about 1.5kgs black cherries in the dehydrator. Yum. Fruit from FarmGate Market. All marked with * from “Put ‘em Up” by Sherri Brooks Vinton. I love the way this book is organised – by produce eg all the things to do with pears are together. Having grown up with some of Mum’s fave cookbooks organised in this way it makes sense to me. I’ve ordered a copy of the first one, and will borrow the Knack and Sally Wise books again from the library. Lots of the books have a lot of jam recipes – If you cut out bread, then there’s no toast to put it on, so we only need small amounts of jam and jellies. I’m on the waitlist for a bunch more books. Will report back when I’ve had time to read and test a few recipes. Review of fruit so far this year. The pears have been superb, about 1.5 to 2 kgs coming off the tree per day. I’m really pleased with how we’ve been keeping up with windfalls. Apples are looking promising. There is a bit of codlin moth on the pome fruits which I will start tackling this weekend with cardboard collars. The tree closest the garage is having large fruit and lots of vertical growth up high so that needs a summer prune sooner rather than later. The gala needs a clear out underneath – some suckers coming up under it, and this will make it easier to pick up windfalls and for the chickens to get under it as well and scratch for bugs. 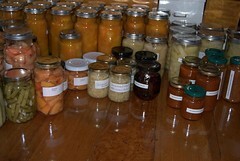 Apricots and peaches suffered from the weather – wet and humid led to lots of brown rot. I think we need to thin out the top Moorpark tree branches and also thin out the fruit at about 2/3 fullsize when still green. This will give more air movement around the fruit. 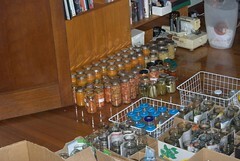 It would have been better to have a harvest of 50% quantity and actually get more than about 5 kilos that was useable. Strawberries are having a second flush of fruit, with some in the front garden – they have responded well to having more water from all the rain. Lots of fruit on the bushes. My cage supports have worked well, needed proper garden stakes to hold the cages vertical once the fruit started to get heavy. they are now restaked. Large quantity fruit – Victoria planted against side fence. Beefsteak style, lovely and sweet rich flavour. Stupice was earliest – only about 10 days behind Meyles using the greenhouse, also earliest of outside plantings, but less fruit per plant. 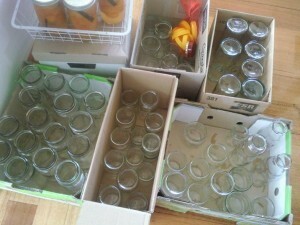 Planning to make some yellow tomato preserves to make the most of the colour. on Friday morning I realised Smoky the japanese bantam was missing from the portable pen, with their scratching there was a dip on one side she must have snuck out – following the sparrows I guess. Sad to think she’s done a runner, but at least there was not a deflated puff of feathers laying around to be found. I must, I must trim Snowy’s wings (her sister) so that she can’t fly. The rose bush shades this more than I would have thought. Cucumber has done well, more on the way. Rockmelon has two fruit. Pumpkins are growing but not setting fruit and I think the zucchini has done its dash. In winter time we plan to plant some fruit trees here anyhow, so not a major issue. Does reinforce the need for SUN! which we have been rather light on this summer. Today we emptied the first batch from our compost tumbler (our Xmas treat to each other). It was made on Dec 27th and has been read to use for about 10 days. So a lot quicker – at the same time we made two piles, one in a black plastic bin, the other in the cardboard box the tumbler came in. 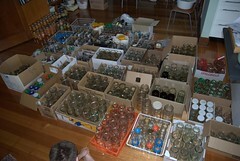 All the same ingredients but the tumbler and black bin got more added water. The tumbler obviously got tumbled, whereas the others just sat. The box bin dried out too much but the middle was looking good. The black bin was about 80% done, but some dry patches so needs a bit more processing. The tumbler compost went on the back of C5 after a quick weed. Also some lined up for the cherry trees in the front yard. Today: into the tumbler – an oldish pile from the bin near the strawberries to finish it off – it’s had stuff added over time so next as blended as could be best, then the compost from the black bin made in Dec. All mixed together and watered. Be interesting to see how quickly that is ready. Filled two black bins with a mix of chicken shed litter, grass clippings, rabbit hutch straw and comfrey. 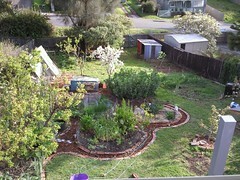 Yesterday we finished the major weed on the front yard. Even the gravel path got a going over. Dug a few carrots from c2 and weeded in there as well. Really pleased with size of carrots this year. Beans are doing well, climbing ones are best. Kentucky are just coming into production and think I like those more than purple king and the other runner beans I planted. The wax bush beans just have had too much competition from volunteer potatos. Mowed and whipper snippered today and everything is looking more orderly. We have apumpkin over the back fence about 20-25cm across, the Turks Turban one from HKG. Waltham Butternut has one hopeful tiny one- about 8cm long at present. A good water should help them along. 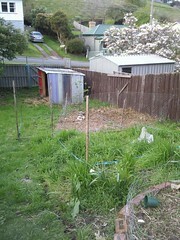 PLanted lawn seed in the patch behind the chicken shed near the fence. Picked zucchinis and small golden nugget pumpkins. Put cardboard under pumpkin vines beside diveway to make it easier to mow around them. Time to figure out winter vegies. Broccoli, Cauli and Cabbage seedlings in greenhouse while i figure out a planting plan. Scattered random parsnip seed from the patch I let go to seed so that I got fresh seed.